Compared with 2D movies, 3D movies have a larger number of audience. Most of the tickets sold in movie theaters are 3D movie tickets. 3D movie is getting more and more popular in this world as watching 3D movies can get audience immersed in the movie scene. With the advancement of modern technology, it becomes easier than before to turn 2D movies into 3D movies. Converting 2D movies to 3D movies is absolutely an effctive way to achieve the aim. For those people who need to convert 2D Blu-ray movies to 3D movies such as 3D AVI, they will find this post useful. Check it out! It is a well-known fact that it needs a 2D Blu-ray to 3D AVI converter to convert 2D Blu-ray to 3D AVI. There are countless converters on the market, which makes it difficult for users to choose the right one. If you are one of those users who don’t have the preferred converter program, you can give Leawo Blu-ray Ripper a try, a professional 2D Blu-ray to 3D video converter that offers 6 different 3D movie effects for you to choose from: Red/Cyan, Red/Green, Red/Blue, Blue/Yellow, Interleaved, Side by Side. Leawo Blu-ray Ripper accepts Blu-ray disc and Blu-ray folder input. And you can rest assured that all kinds of encrypted Blu-ray discs are supported by the professional 2D Blu-ray to 3D video converter. As for the output file, a variety of common video formats and HD video formats are available for setting. You could choose to create 3D AVI videos in various 3D effects from 2D Blu-ray movies with this Blu-ray Ripper software. If you want to create 3D AVI videos out of common 2D videos instead of 2D Blu-ray, you could make use of Leawo Video Converter. Now, follow the below steps to know how to convert 2D Blu-ray movies to 3D AVI movies. Step 1: Free download and install this 2D Blu-ray to 3D AVI converter or Blu-ray 3D Ripper on your PC. Mac users should turn to its Mac counterpart Leawo Blu-ray Ripper for Mac – Mac Blu-ray 3D Ripper. Click the "Add Blu-ray/DVD" button to load source Blu-ray movies after kickoff. While loading, you could choose to load desired Blu-ray content via Full Movie, Main Movie and Custom Mode loading modes. Click the "Edit" icon in each loaded Blu-ray title. The program would show you an editing panel, on which you should open "3D" tab, and then switch "3D Effect" button to green to select a desired 3D effect from six 3D modes provided: Red/Cyan, Red/Green, Red/Blue, Blue/Yellow, Interleaved, and Side by Side. Click the drop-down box (named "MP4 Video" by default) next to the "Add Blu-ray/DVD" button and then select select "Change" option. You will be guided to the Profile panel where you need to select AVI as output format from "Format" tab. 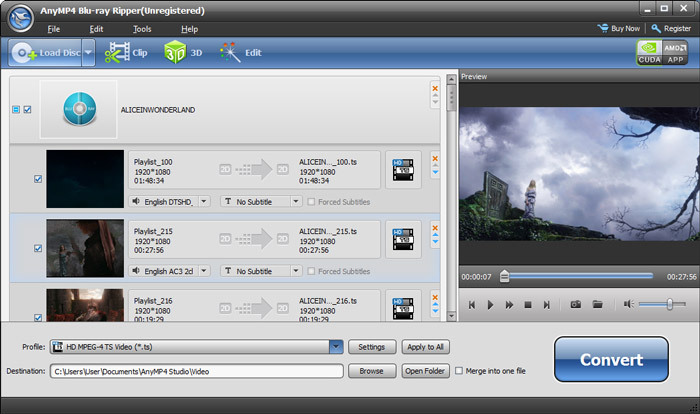 Click the green "Convert" button on the main interface and then set "Save to" directoy on the popup side bar to save 3D AVI video created from source 2D Blu-ray. After that, click the "Convert" button at the bottom. This 2D Blu-ray to 3D AVI converter will start to rip Blu-ray to AVI 3D video immediately. AnyMP4 Blu-ray Ripper provides another solution for Windows users to convert 2D Blu-ray to 3D AVI. This wonderful Blu-ray Ripper can help you convert Blu-ray to 3D video format and provides you with five 3D modes. Let’s see how to convert 2D Blu-ray to 3D AVI with AnyMP4 Blu-ray Ripper. On the main interface of AnyMP4 Blu-ray Ripper, click “Load Disc” button on the sub-munu to load Blu-ray disc. Click “Profile” drop-down arrow and open the “Profile” list, where you can select “3D Video” column and then choose one 3D format like “AVI Anaglyph 3D Video (*.avi)” as output format. And then you click “3D” button on the sub-menu to choose a 3D mode such as “Anaglyph (Red/cyan)”, “Side By Side (Full/Half-Width)”, etc. Click “Convert” button and you can begin to convert Blu-ray to 3D AVI video. Support a variety of output devices such as iPhone 6s, iPad Pro, iPod, etc. As is clearly shown in the table chart above, Leawo Blu-ray Ripper and AnyMP4 Blu-ray Ripper have nearly the same Blu-ray ripping function. However, if you want to rip encrypted Blu-ray discs, you should make use of Leawo Blu-ray Ripper.